The importance of a pair of well-shaped eyebrows in our face can never be ignored. You may admit it or not but the way you groom your brows can make or break your look. There are eyebrow boutiques where you can get them threaded or waxed professionally. But what if you want to do that by your own? Yes, you can definitely trim or tame your eyebrows and give them the perfect shape just by using a good pair of tweezers. We will show you how. At first, you have to make sure that you are not wearing any sort of makeup. Remove your eye as well as facial makeup (focusing on the eyebrow area) with the help of a good quality makeup remover and a cotton ball gently. Now, cleanse the skin around your brows with a damp washcloth. You may want to exfoliate dead skin cells and hence, make the use of a mild facial scrub too. Rinse with lukewarm water, once you are done. Pat it dry. If you are going to pluck your eyebrows for the first time, you may be worried about pain. Just rub an ice cube or apply a numbing gel onto the entire area around your brows to limit the ache. Brush your brow hair upwards and a little outwards by using the round brow brush or spoolie brush. If any of them goes beyond the natural shape of the eyebrow, cut off with the scissor. Now, take a regular or a magnifying mirror and a pair of slanted tweezers and place yourself by the side of a window or in a well-lit area. Start with marking the natural shape of your eyebrows with the brow pencil. Your objective is to find out those two points from which you should start your tweezing and at which you should finish it. Firstly, hold the brow pencil upright against the side of your nose and mark the point where it meets the inner corner of the brow. It is the point where your brow should start. Secondly, hold the brow pencil crossways from the side of your nose and line it up with the external edge of the eye. Mark the point where it meets the outer corner of the brow. It is the point where your brow should end. Lastly, hold the brow pencil slightly crosswise from the side of your nose again and line it up with the exterior of your iris. Mark the points where it meets the outer as well as inner edges of the brow. These should be the top and bottom of your brow arch. 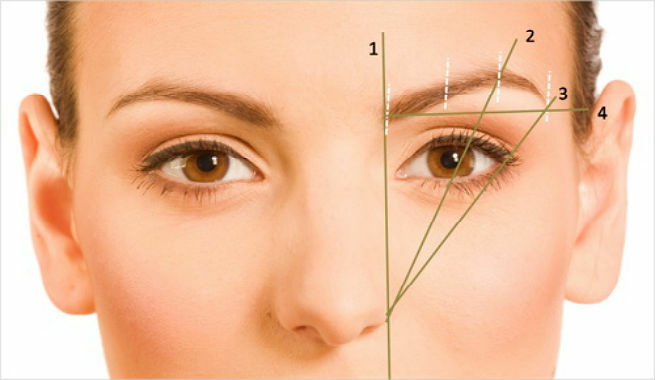 Join all these points with the brow pencil to figure out the ideal shape of your brow. Repeat steps 2 to 5 for the other eyebrow. Now, start plucking the brow hairs that do not fall inside the shape marked by you. You must stretch the skin tight with your fingers and tweeze undesired hairs in the direction of their growth by grasping one by one close to the root. Beginning right from underneath the arch can always give you more control. So, start tweezing hairs from the underside of the brow and shape up the arch precisely. 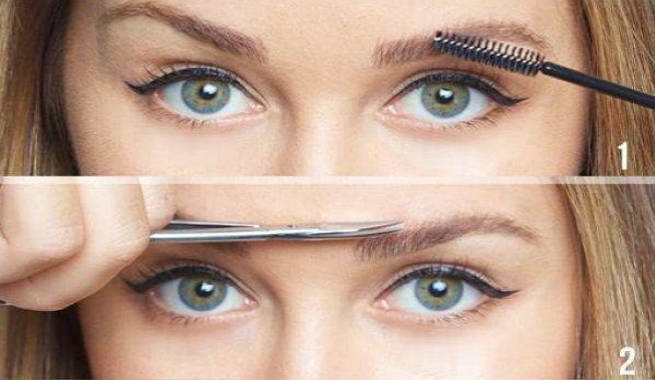 Move to both the corners of the brow one by one and pluck the extra hair out carefully. 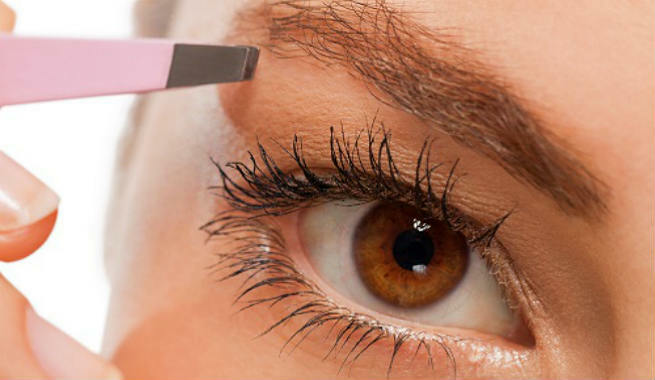 Do not forget to clean up the area between the beginnings of your two brows. Tweeze the stray hairs in between them and make the skin smooth. Repeat steps 8 to 10 for the other eyebrow. Finally, rub an ice cube or some aloe vera gel onto your eyebrow area in order to soothe it. Keep your tweezers in good condition by wiping them with alcohol, sharpening them in regular intervals or simply replacing the old ones. Stay away from over plucking your eyebrows. Grooming the brows once every 3 weeks will do. Do not skip marking the ideal shape of the brow. Otherwise, you may end up making too much of an arch or plucking too much off the corners. Try tweezing your brows right after taking a hot shower as tepid water will make the hairs softer and open up the follicles properly, thereby making your task easier. Feeling pretty confident, right? Just give it a try.